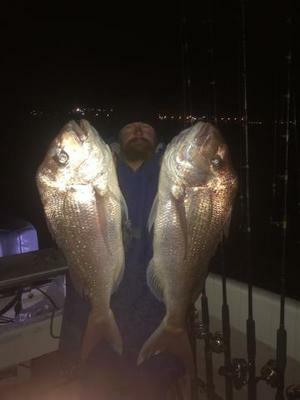 DOUBLE UP: Daniel Sparks with his pair of 7kg winter snapper. Anglers didn’t have to travel far for action over the past week, with excellent numbers of garfish present off the rocks at St Helens and Limeburner’s Point. A small piece of silverfish under a float did the trick, with the use of berley producing larger numbers of fish. Casting soft plastics accounted for plenty of Australian salmon around the waterfront. It appears the salmon have really set in for the winter. Daniel Sparks ventured out for a night session during the week in search of a big winter red. After waiting out the cold his rod buckled over and lined peeled off, with the culprit turning out to be a serious winter snapper of 7kg. Wanting a chance of another, Daniel baited up and cast out again only to catch another snapper of 7kg. The Bellarine Peninsula hosted incredible amounts of squid, with the area all the way from Clifton Springs to St Leonards on fire. Any weed or reef patch in 3m to 4m held fish, with size three jigs like the new Odori working a treat for anglers who took bag-limit captures in half an hour. Whiting were patchy at St Leonards but anglers who persisted though the small fish managed to bag some respectable specimens. Silver trevally kept anglers fishing bluebait or pippies busy inside Swan Bay. Gummy sharks to 8kg were taken in the bay after dark on baits such as cured eel and trevally fillets. Point Lonsdale Pier produced some big salmon to 3kg on the run-in tides. Casting lures or fishing pilchard fillets on paternoster rigs were both effective. Coastal beaches also fished well for salmon on bait or lure, with this winter shaping up as one of the best for surf fishing in years. Portland remained hot for great numbers of school-sized southern bluefin tuna, although Port Fairy was also worth a shot as an easy daytrip from Geelong. Lake Bullen Merri was consistent for Chinook salmon to just over 1kg. Flat-line trolling Tassie Devils or Daiwa Double Clutch lures was ideal at first and last light, while brown trout to 2kg were also taken. Lake Bolac produced well-conditioned rainbow trout for anglers fishing Powerbait from the shore. Patience was key to success. Wurdiboluc Reservoir was productive for anglers casting spoon-type lures or the old faithful Pegron tiger minnow. Next week should provide good fishing for squid at St Leonards, whether land-based or by boat, while freshwater fishos should consider taking a drive to Lake Bullen Merri.